The Elk County Council on the Arts is supported in part by members and local businesses. Our annual membership season runs from September 1 to August 31- if you're already a member we thank you for support. If you haven't joined please consider becoming a member or business sponsor today. All members receive ECCOTA's newsletter, invitations to special ECCOTA events and discounts on ECCOTA Classes, plus receive a 20% discount on every Gallery purchase during the month of December, and during your birthday month. Did you know- you can double the impact of your gift if your employer offers matching gift contributions? The process is as simple as completing a standard matching gift form from your employer and mailing it to ECCOTA. Just check with your HR manager to see if your employer has a matching gifts program. Geno Boni of Mudslide Pottery offering a pottery throwing demonstration in the ECCOTA Gallery window. Each membership dollar helps support local artists! We are also happy to accept donated goods purchased through our Amazon Wishlist or from local retailers. Sponsorship helps us ensure that children can attend our summer camps, that Arts in Education residencies will be funded, and that we can invest more in public art programming. We have sponsorship levels priced for any business. If you have questions about sponsorship benefits please let us know. Would you prefer a different sponsorship benefit, or would you like to offer a donation of goods or services? We always appreciate an offer! Please call or email Sara Frank, 814-772-7051, sara@eccota.com. 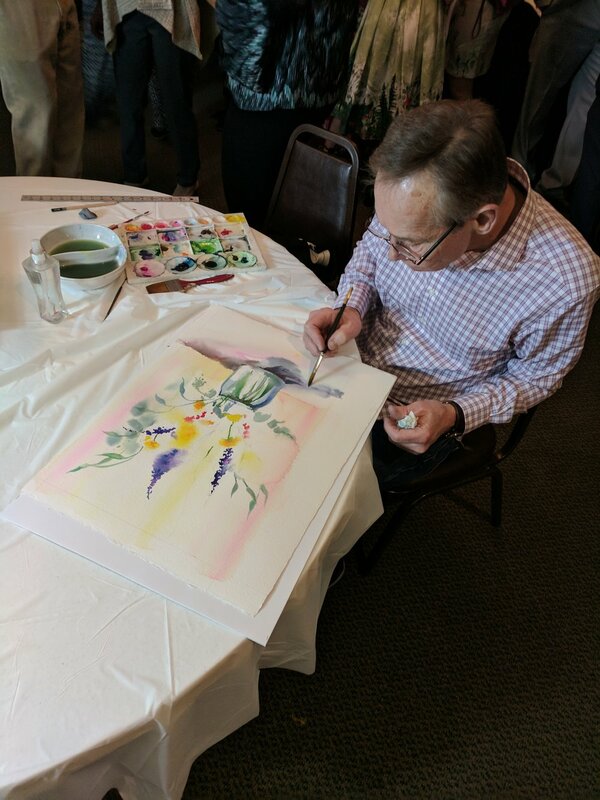 Pete Winklbauer paints a live auction piece at the Annual Gala Fundraiser. - 4 tickets to our Annual Gala Fundraiser, to be held March 9, 2019 at Aiello's Cafe in Ridgway. Additionally, your company's name will be listed as a sponsor in all marketing materials for the event. - 8 tickets to our Annual Gala Fundraiser, to be held March 9, 2019 at Aiello's Cafe in Ridgway. Additionally, you will had a sponsored table for your guests and your company's name will be listed as a sponsor in all marketing materials for the event. - Your logo on the ECCOTA website recognizing you as a season sponsor. - A thank you posted on ECCOTA's social media recognizing you as a season sponsor. - Signage within the ECCOTA Sales Gallery recognizing you as a season sponsor.